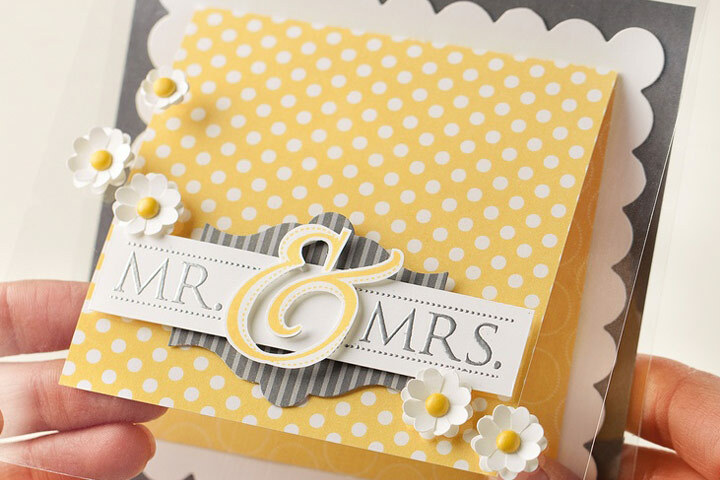 Wedding cards set the perfect stage and tone for the events to unfold as you begin the preparations for your big day. 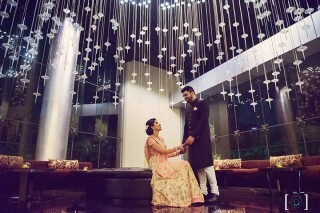 Indian wedding cards are unique and tradtional yet in recent times have been steadily borrowing ideas/themes and styles from their western counterparts, just like the weddings themselves. 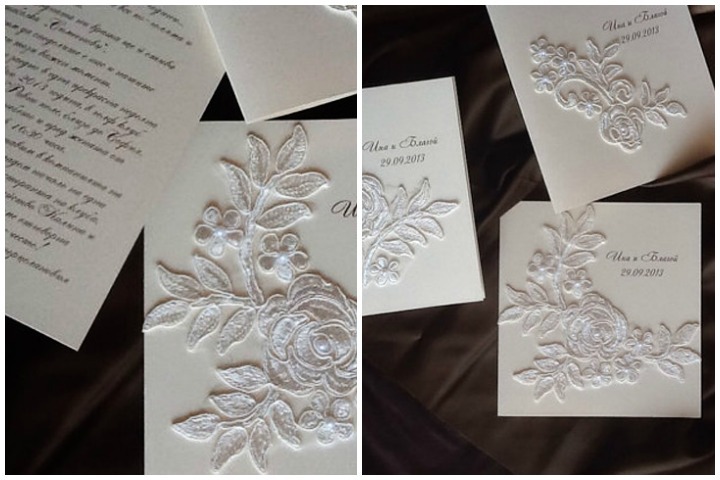 To help you out, we have compiled a list of 40 great wedding invitation cards that we absolutely love, to help you in your quest for the perfect Indian wedding cards to announce your union. Handmade and exquisitely done with delicate lace work on vintage paper with a floral theme, this card with its airy and feminine tones is a absolute stunner. 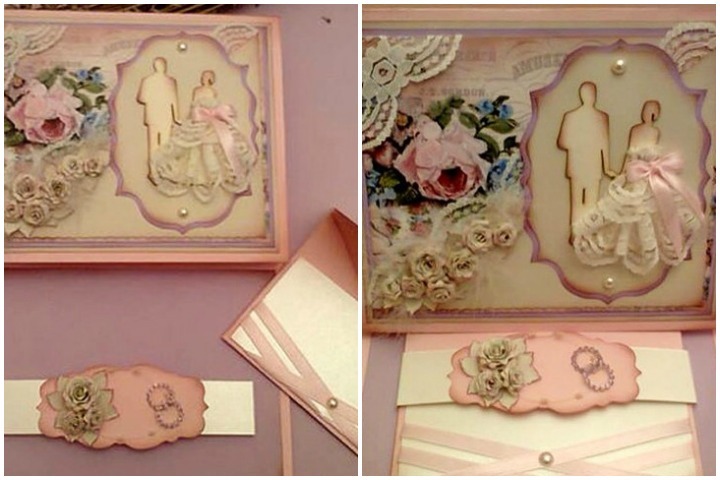 With the 19th century style card and a dull pink treatment, this is our pick from wedding invitation cards collection and has classic love written all over it. “Breathing dreams like air” is one of Scott Fitzgerald’s quote from the movie. Exclusive and expressive at one go; this intricately designed card personifies the classic, dreamy fairytale wedding that you deserve. 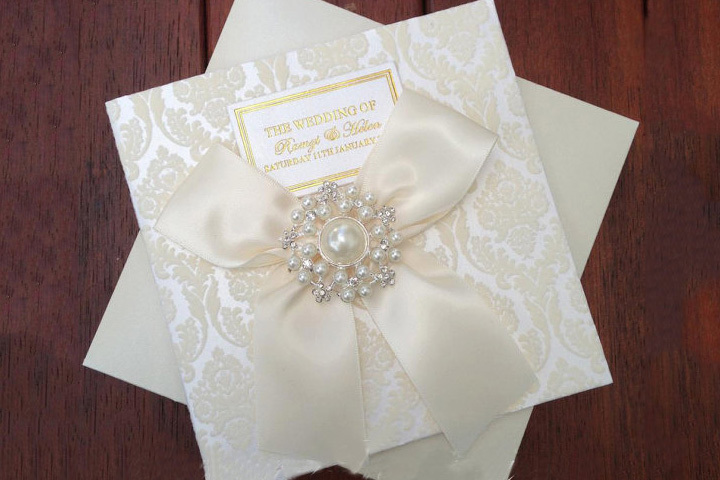 This card’s cream flocked damask pattern with a large ivory pearl brooch puts it in a class of its own. A timeless design that can transcend over planes as a singular unifying theme, it gets bonus points for being a relative rarity as far as Indian wedding cards are concerned. Another vintage design with a floral theme, it is however in monochrome. 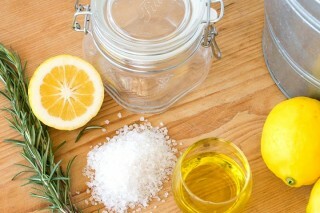 This lends it a subtle blend of elegance, sophistication and simplicity. A story board for the adventure loving couples-to-be. Share your story, mark your milestones and welcome everyone with this beautifully designed story board themed wedding invite. 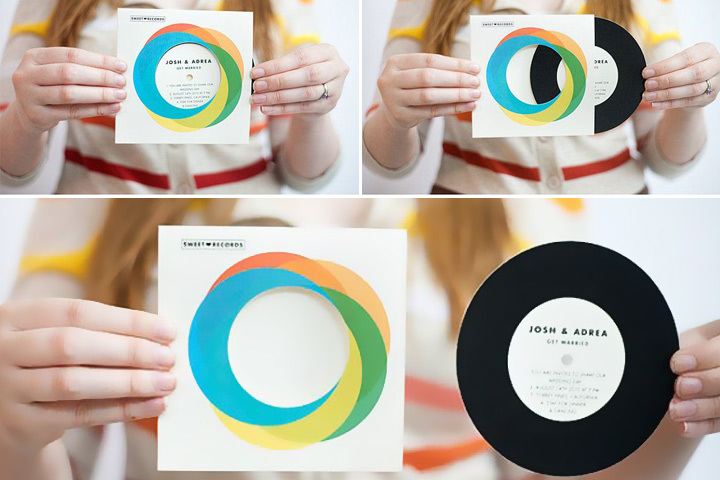 A CD inspired wedding invite, may be the best way to share your thoughts. 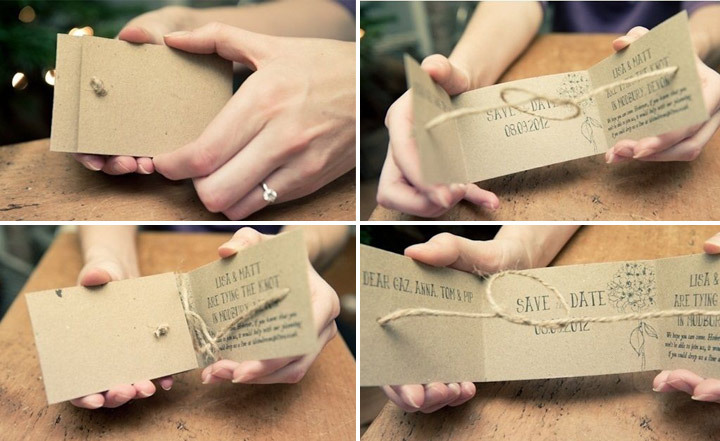 A DIY wedding card idea for the creative souls. 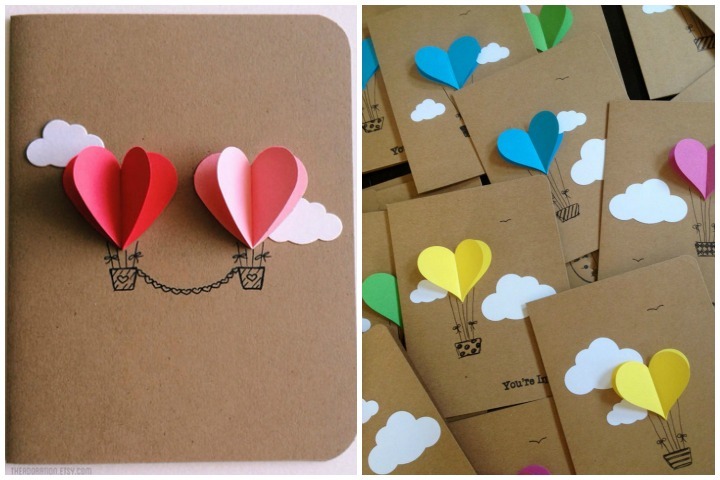 Eco-friendly cardboard paper and some colored litho paper come together to make this sweet, simple and stunning card. A few colored pears, velvet cloth and some embroidery material is all you’ll need to create this very personal card, which has your unique stamp all over. Truly an American Design. A color and design reminiscent of America’s old glory days; very cheerful, brimming with optimism and full of life. 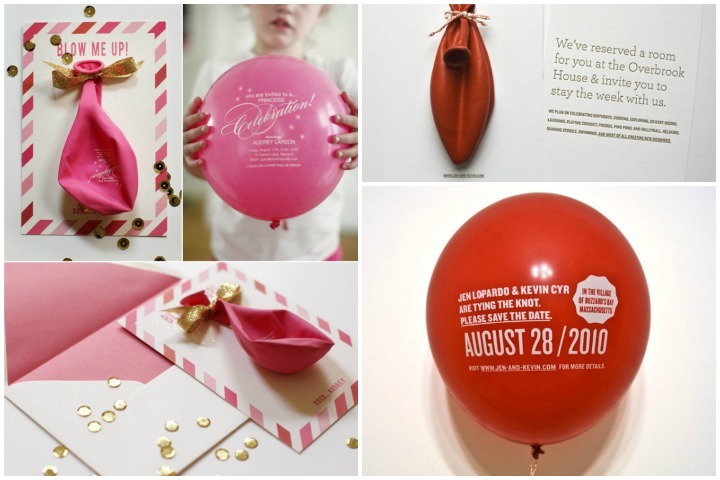 This invite takes tying the knot, quite literally. Made with eco-friendly paper, this fully recyclable card is green and symbolic. The food lovers ultimate handout. 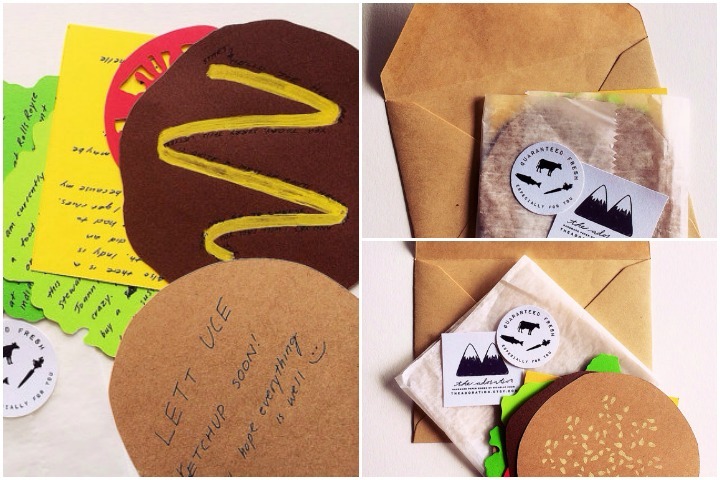 A wedding invite that’s designed like a burger with each page mimicking the ingredients. So your patty holds the invite while your cheese slice has the venue details and more. Surely a treat for the eyes. 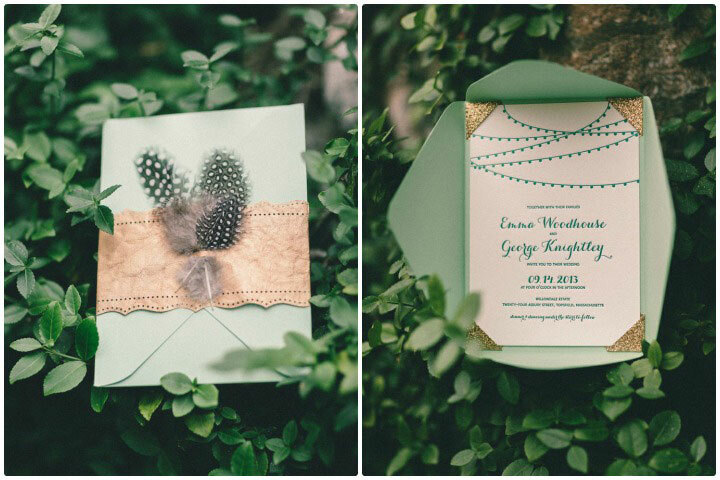 A green themed wedding card with exotic feathers and a handmade paper jacket that oozes style. 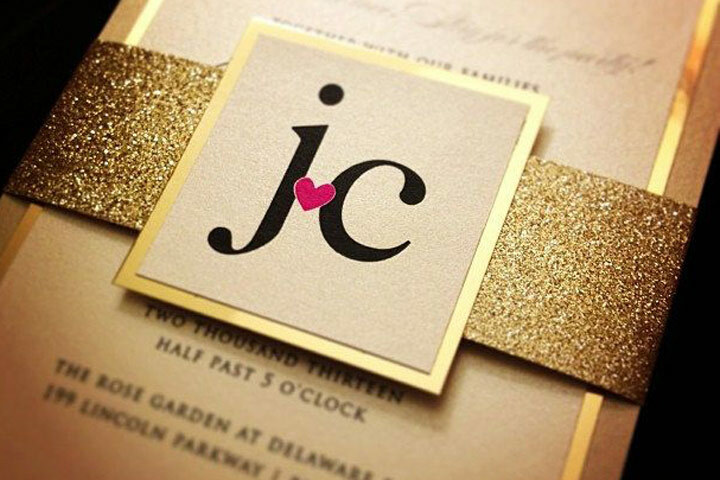 Gold only highlights the glamour quotient, making this a super-slick and stylish invite. A perfect Indian wedding card for an outdoors wedding. A simple card with a clear text and a set of candid photos of the bride and groom-to-be sets the perfect tone to your impending nuptials. An Embellished Wedding Invitation with Ruby Ribbon & Ivory Rosettes with pearlescent metallic paper and Swarovski crystals as border accents. That’s bound to make eyes pop out! A card with a gorgeous gold theme along with a real gold plated jacket that further accentuates the design. A DIY idea that’s an interesting mix of magnets, wooden wheels and kraft paper. Its personal, customised and a whole lot of fun to make. A DIY card with brown recycled paper and colored Kraft sheets can be printed, or perhaps handwritten for that personal touch. This friendlily wedding invitation design is placed onto a wood textured panel giving it a unique rustic touch. The panel has a pocket to hold, miscellaneous items and RSVP sheets. Coloured in cream, brown and pink, this card is classy. 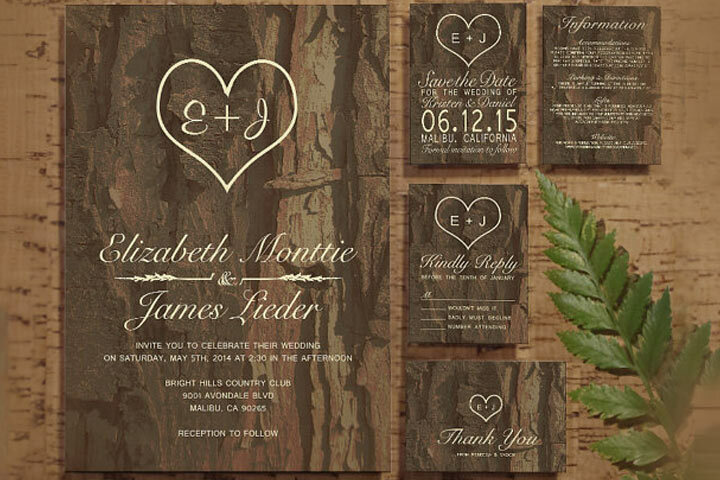 These lovely tree bark invites are made with a real redwood base, giving them an authentic and rustic natural look. 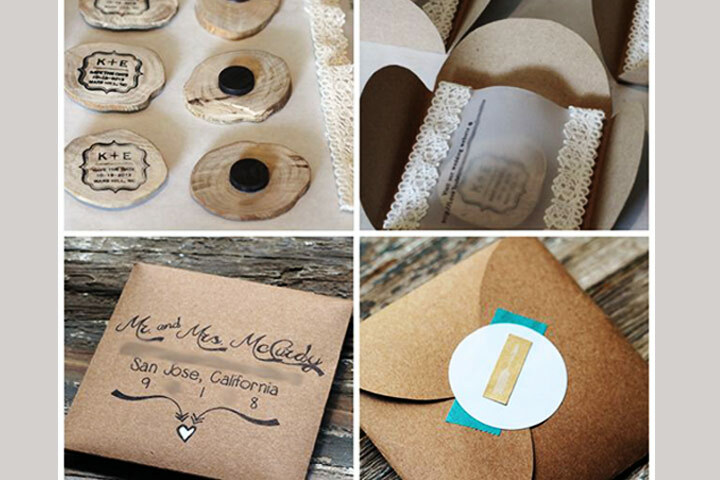 If you want to have a woods styled wedding and love the rustic theme, this is a great way to invite friends and family for your wedding. 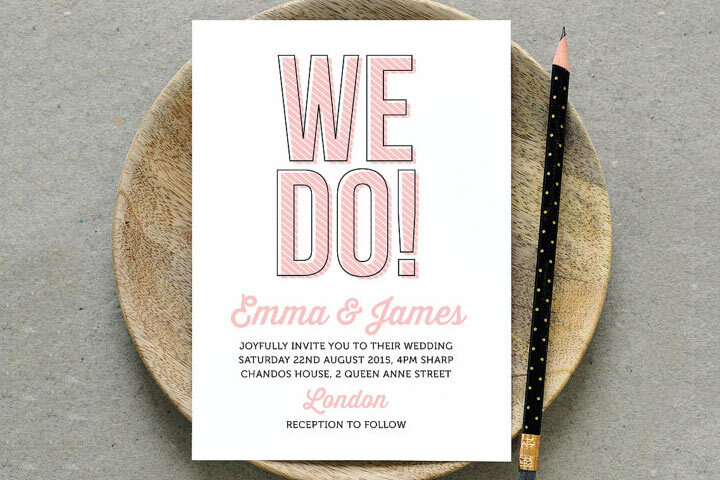 A straight and simple ‘we do’ Invite that is minimalistic in its theme and design. It can be a DIY project or a simple job at the printers. Pink and black on plain white paper adds to the simplistic nature of the card. 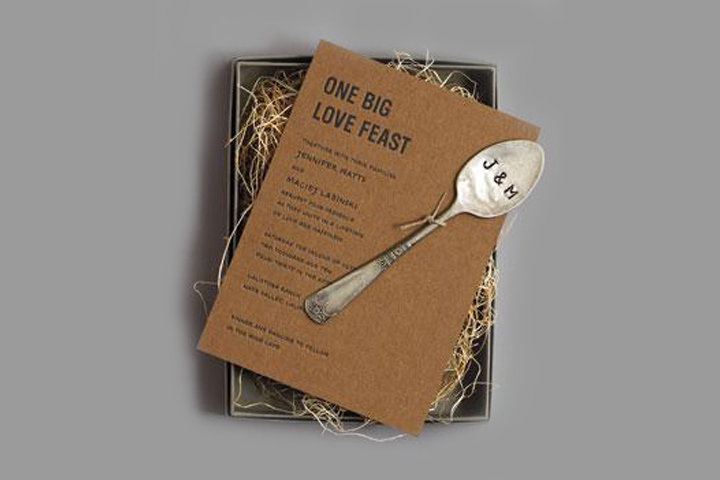 Set the spoon (quite literally), if not the table, for the foodie celebrations with an invite that features a silver or a silver plated spoon engraved with the couple’s initials. Grungy card design and a custom engraved spoon just don’t make your card look unique, but memorable. The celadon, gold and dull pink coloured art deco inspired letterpress card is an example of how a card can set a theme for the wedding. 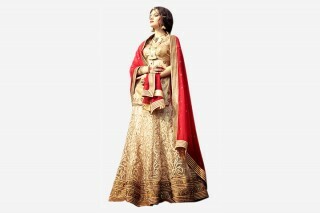 The subtle design is textured with finesse and can be made an inspiration for the decor of the wedding too. Very European and classic in its theme and feel. 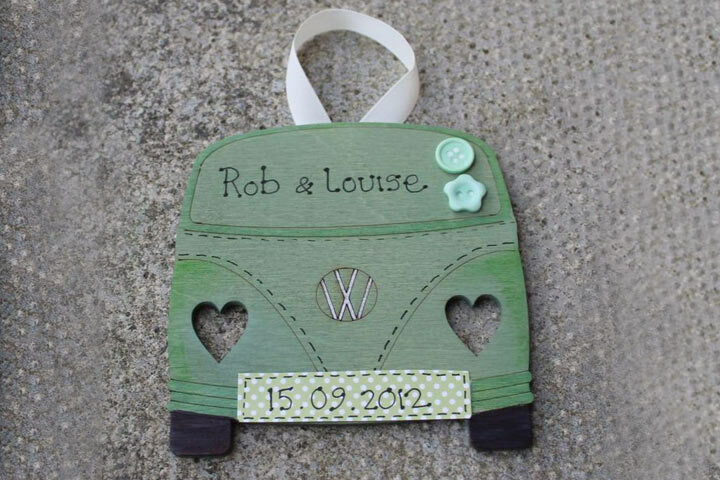 If you are planning for a destination wedding and are travellers at heart, this is the card for you. 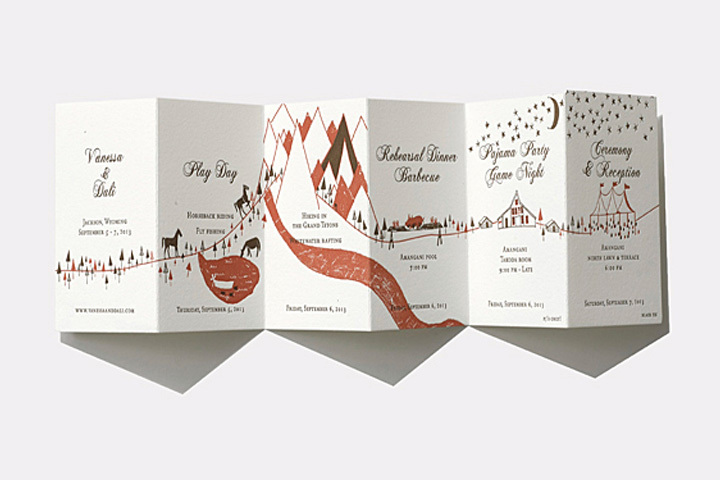 A multi-fold invitation with a unique travel-inspired storyboard which is perfect to build up the momentum up to your wedding. This blow-me-up to read the message balloon invite is quirky, crazy, off-beat and fun – just like the two of you. If wedding cards can make people smile, this card would make them laugh out loud! 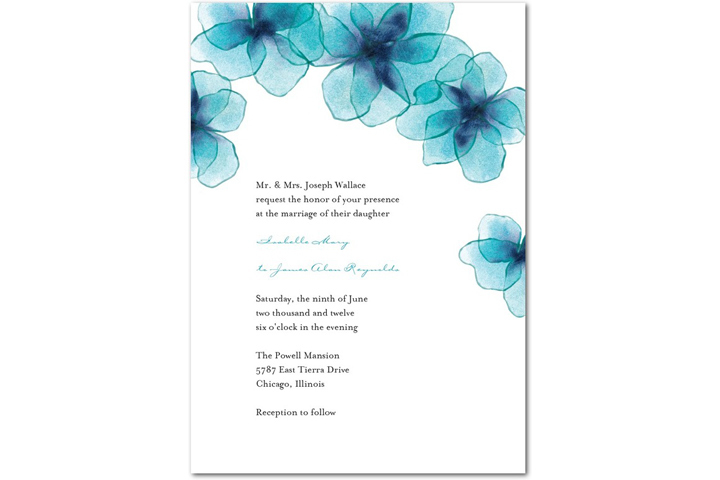 A stylized grey and dull blue monogrammed flip-out invite that appeals your eyes with its pleasant color play and pleases your heart with its character. 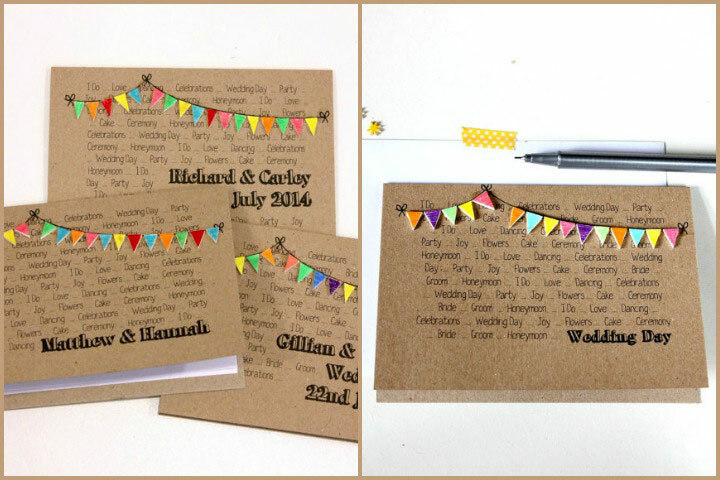 The best way to describe this invitations is actually in the words of the bride. 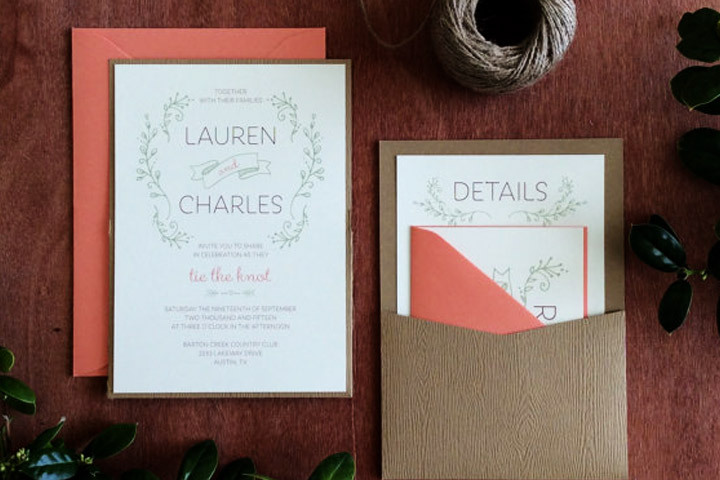 Designed by Charlotte Fosdike, the bride, explains, “I knew that I wanted our wedding invitations to be something that our friends and family would remember and hold on to, long after the wedding. 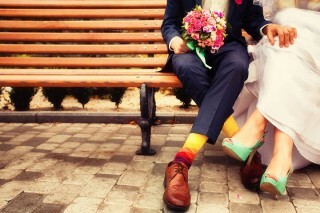 I also wanted the invitation to deliver the essence of what we are as a couple. We are both highly adventurous people – we love traveling, discovering new foods, going to markets, meeting new people and exploring the world with all of our senses. I hence decided to create an invitation that would give our guests a small taste of us and to share with them the treasures of new and exciting flavours. 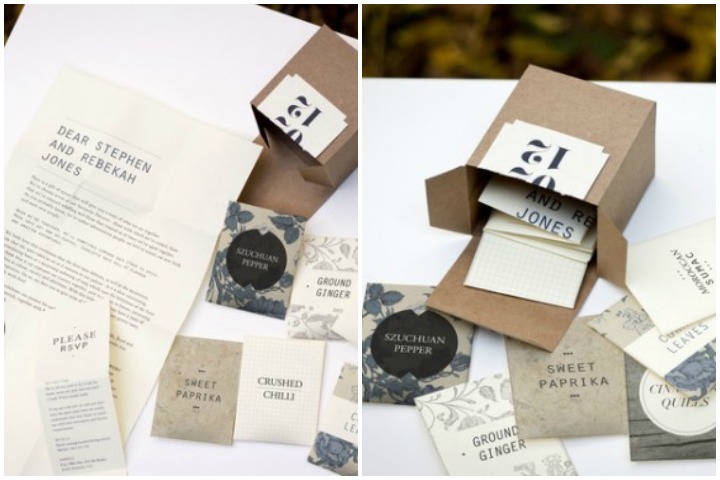 It would deliver beyond visual representation by including interactive packaging to appeal to touch and a mixed array of spices in the packets to delight through scent and taste.” These ingenious wedding invites by this innovative couple also feature a box full of specially selected spices for the guests. 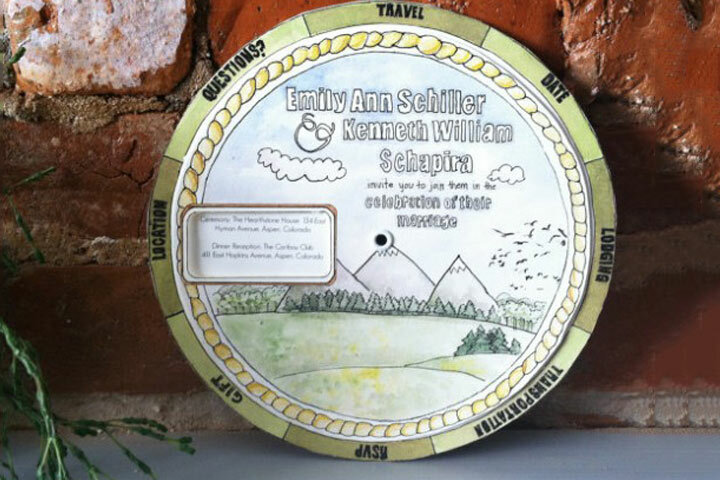 An innovative moving compass wheel with all the important dates and events marked for the guests to read. 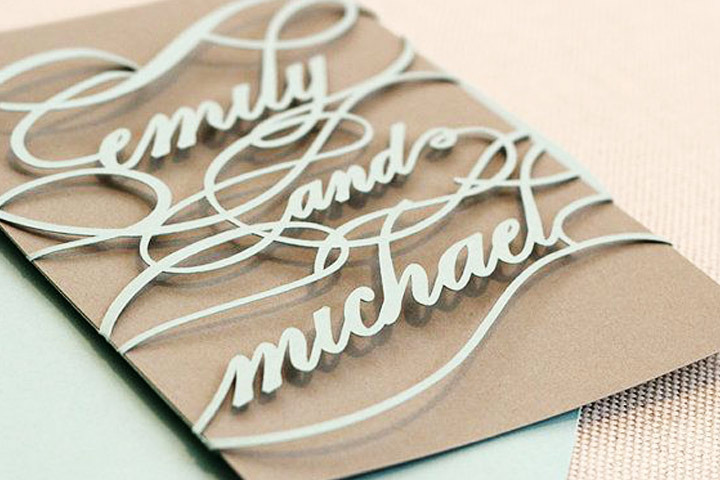 This wedding card makes for a fun, adventurous read. 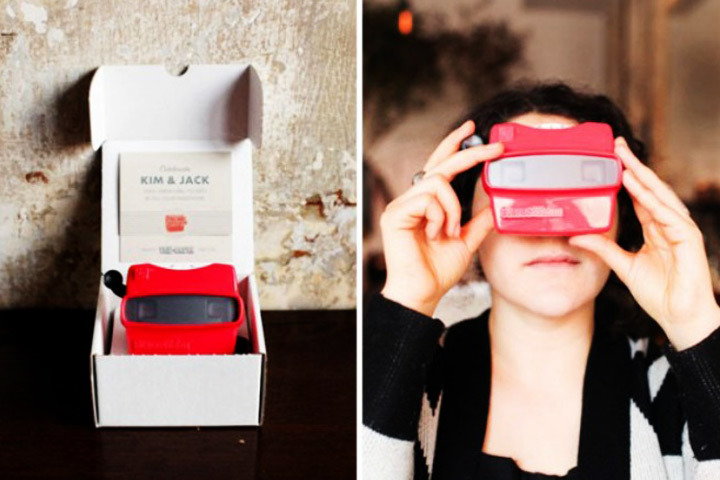 Remember rolling of the colorful slides on a ViewMaster at school? Well, this is the Invite for the off-beat couples to be. It’s unique, it’s fun and its definitely going to be a one-of-a-kind invite that will thrill the guests and their little ones at home. Created by the talented artist and designer Olga Cuzuoic, who specializes in innovative paper folding designs, this card is an absolute gem and promises to make your wedding card stand out. 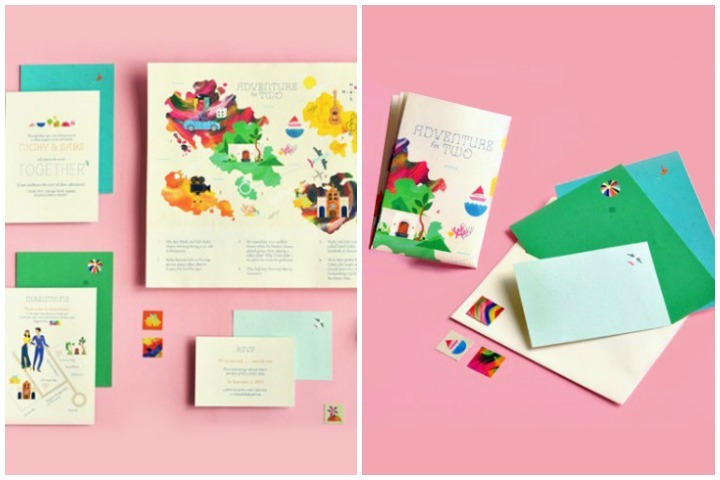 Colourful and quirky, this invitation is actually a collection of cards rather than a single invite. 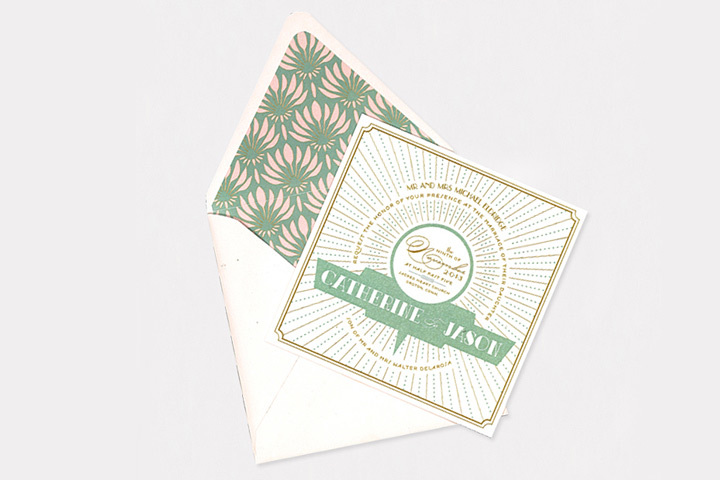 A simple vintage photo invite that can be instantly made online with these few steps – mail a beautiful photo of yours to the designer/seller (Nostalgic Imprints’ vintage stationery, for example), download your personalized wedding invitation and you can just print it at home! 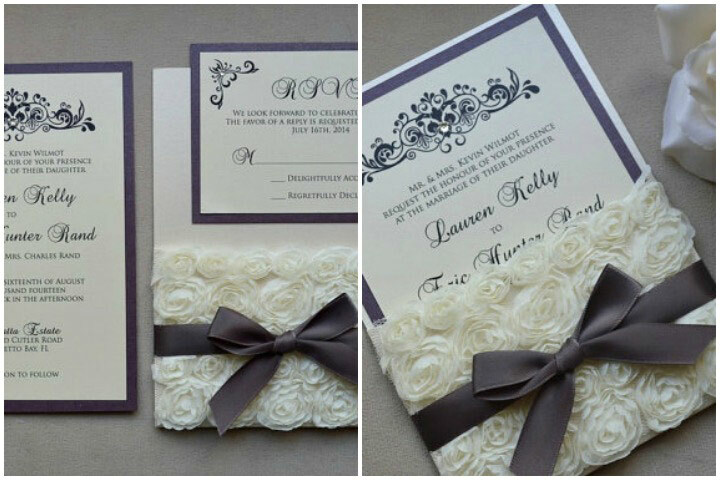 A very easy and elegant invitation that’s super pocket friendly. A beautiful tropical themed card designed by the super talented guys from Rick Ink / Momental Design. 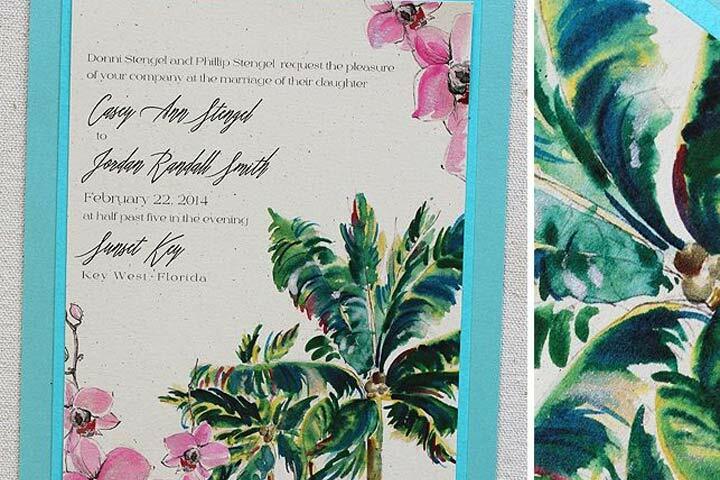 This wedding invitation is a good bet if you are planning to have a tropical themed wedding, off on a beautiful island or an exotic coastal town. A scenic painting on hand made paper with a sky blue cloth border adds to the charm. 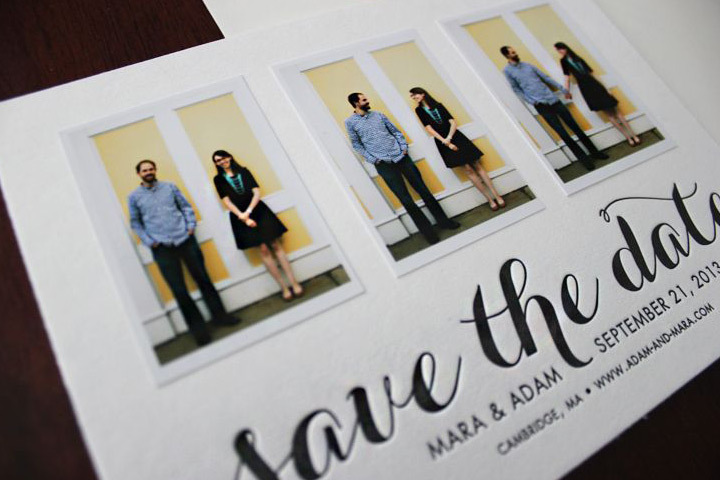 An off beat wedding invitation that is a collection of beautiful pictures of the couple that resemble a photo booth’s filmstrip. 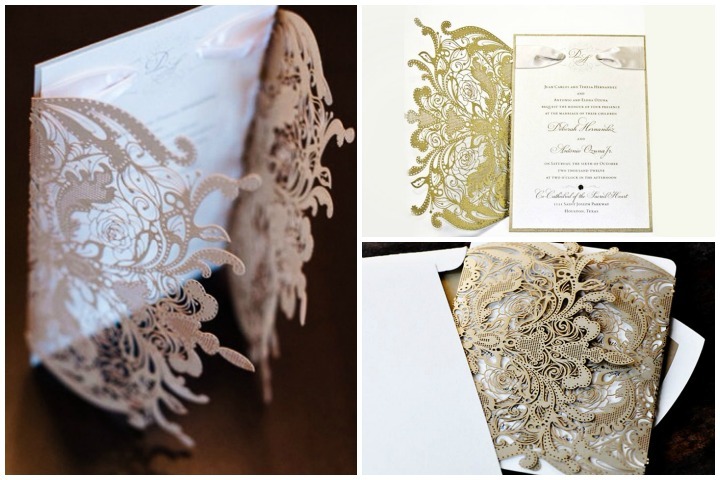 The design is modern and the feel is glossy, a very stylish and different wedding invitation for the interesting couple. Another take on the photo booth filmstrip wedding card, this invitation is a blend of a very traditional design and a modern filmstrip . 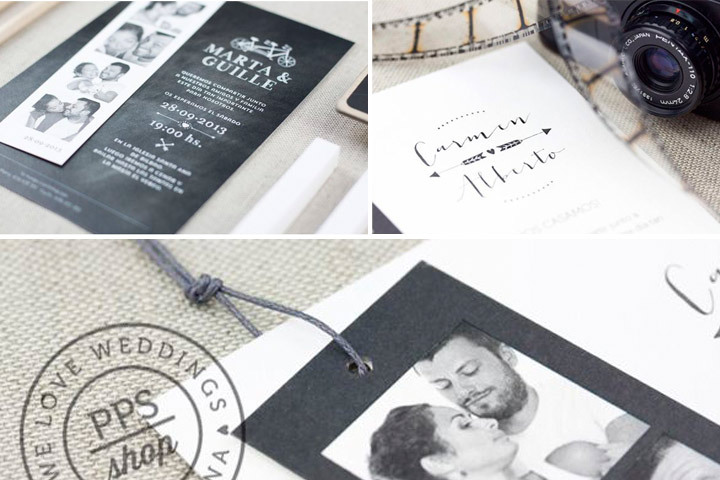 The card in matte black and off white has a handmade filmstrip tag of the couple attached to it giving the invite a very interesting look. An option you can definitely consider if you want your card to be simple and traditional but have that little element of surprise. A card so simple that it is actually beautiful. 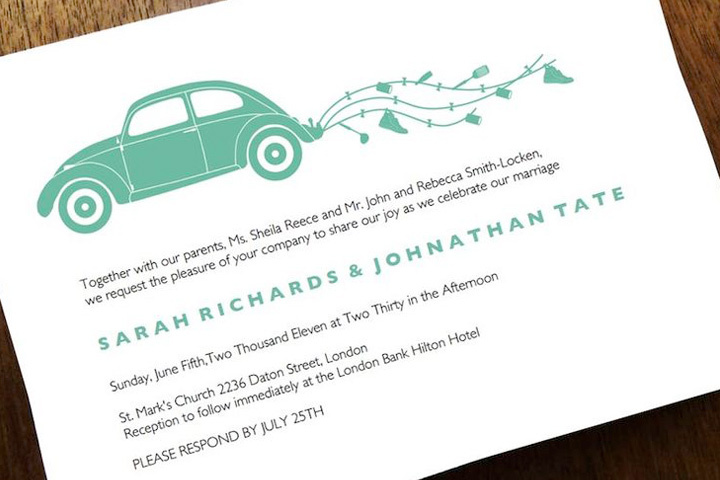 An old Volkswagen Beetle with a set of dangling cans for a wedding getaway car not only sounds awesome, but also looks brilliant when printed on to a wedding card in dull Shamrock green! Plain, simple and superlatively uber-cool. 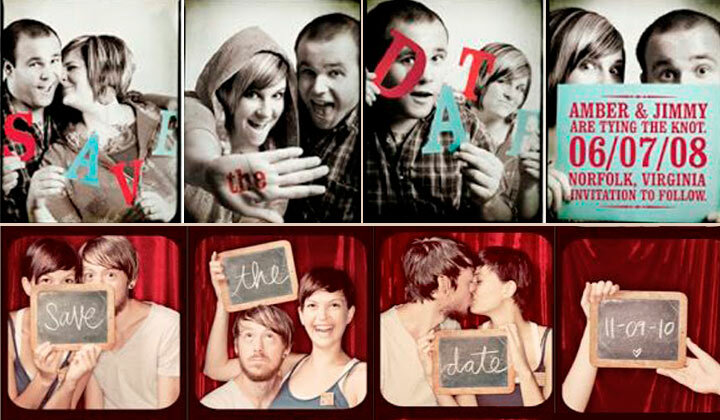 A set of innovative photographs of the couple, that is placed in a collage that makes it look like a heart. Very interesting and very cheerful. You can actually share the good news by showing ’em how excited you are about the wedding with this heart shaped collage invite. Inspired by the video games of the 90s, this card is innovation at its best. 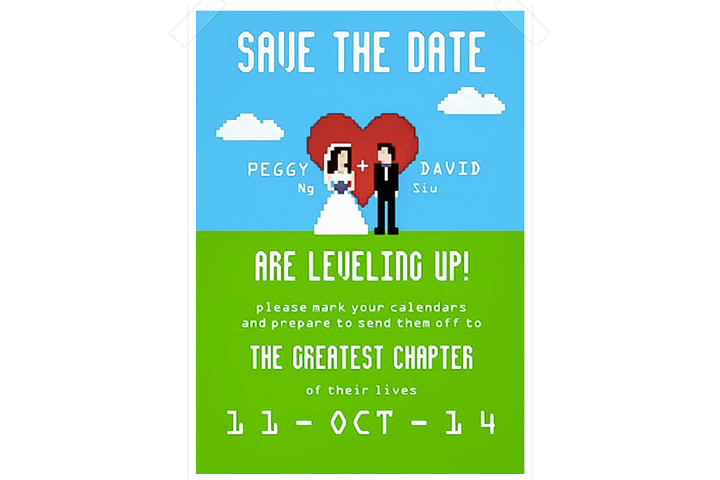 Designed with a “Save the Date” heading and the picture of a couple with an interesting storyline that actually looks very cool. A card that’s a must have for all the gamers out there. Who wouldn’t remember the iconic VW camper van that was the choice of wheels for most of the old pop-rock bands and was an inseparable part of the 70s hippies culture. 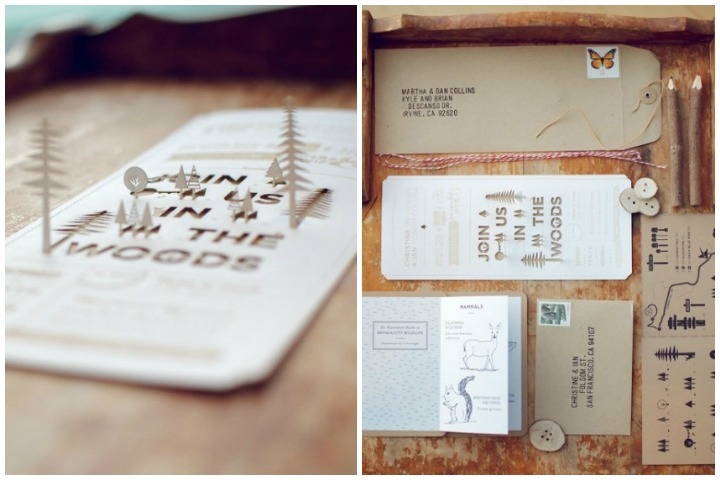 This wedding invitation is a super cool take on that iconic wagon. 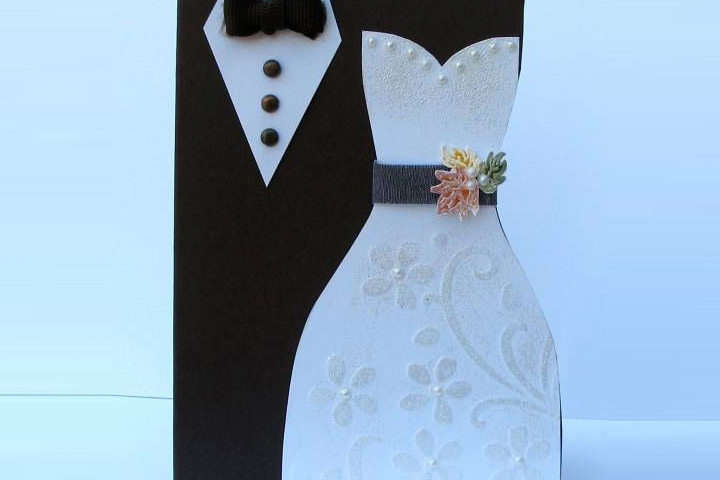 Made of hard paper board, this wedding card is a keepsake which can also double up as a wall or a showcase decoration. A stunningly simple design theme. This wedding invitation charms you with its simplistic white texture and the amazingly dreamy looking HD blue flowers for garnish. A card that is absolutely pleasing and can also double up as a source of inspiration for the decor on your big day. 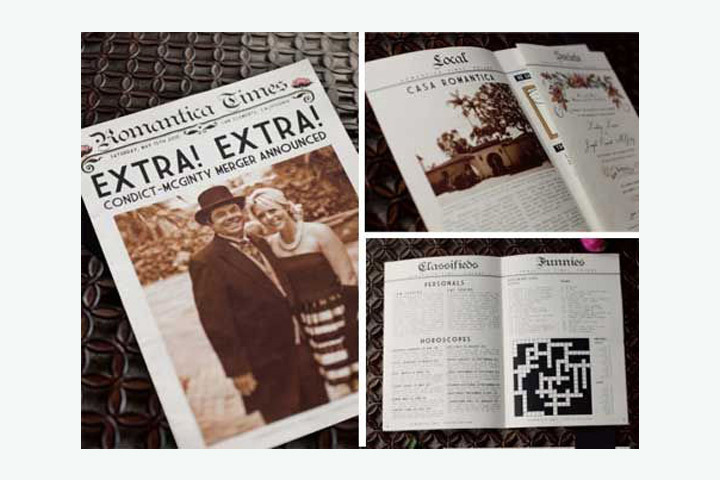 Based on a vintage NY Times’ newspaper design, this wedding invitation is fully donned in sepia to look and feel like an old newspaper! 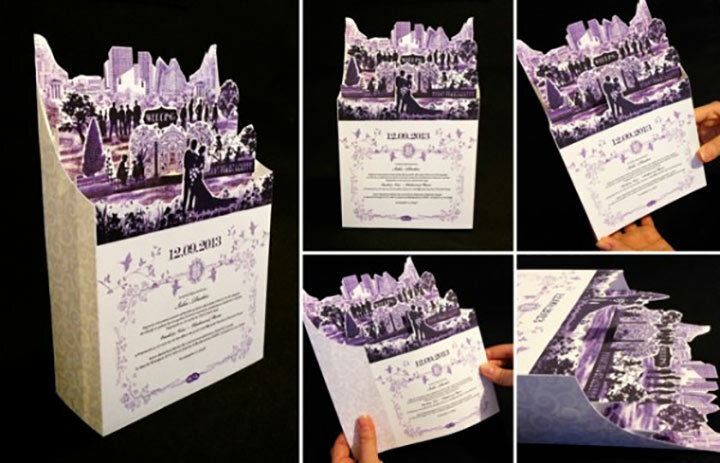 With innovative pages, press-bureau like photographs and off-beat headings everywhere, this is one wedding invite that is sure to stand out in everybody’s mind. Gutenberg’s moveable-type printing press in 1447 changed the course with its path-breaking invention that revolutionized printing and made it available for many. 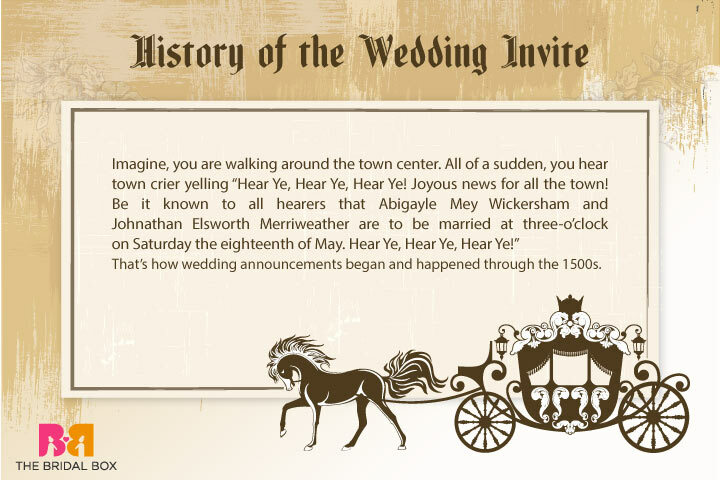 In the 17th century, newspapers were a medium for invites and that is where the still-in-vogue-tradition of publishing your wedding invitation cards in the papers had originated from. Later on, for sending invites to a select audience, engraving invites on wood became popular and was a precursor to personalized invites on paper as we know today.